Marvel kicks their comics into high gear this week as anxious fans await Star Wars Celebration in Chicago. 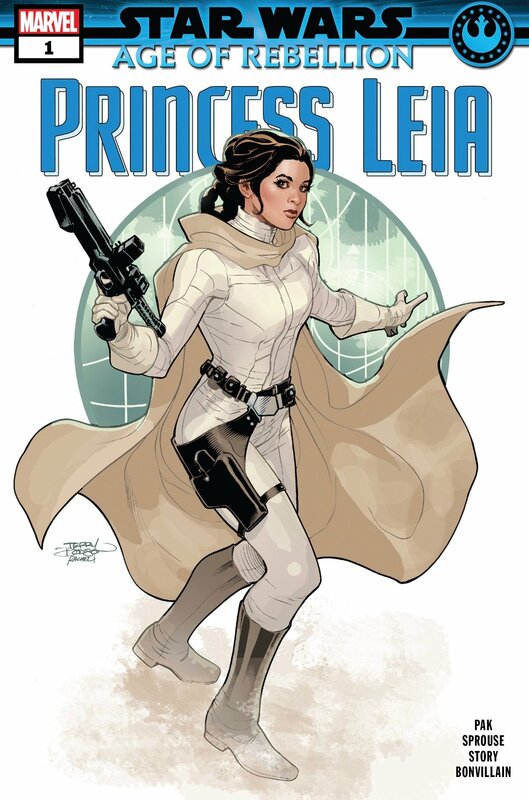 For those waiting to get in or watching at home on their devices, writer Greg Pak has an excellent story about how Leia got into character before striding into Jabba the Hutt’s palace as notorious bounty hunter Boushh and staring down the gangster with a charged thermal detonator. I’ve always wondered about what went into the trappings of Boushh and for the first time in canon, we have our answer with this wonderful issue. The Age of Rebellion begins! SPOILERS AHEAD…. Leia and Chewie are on the Millennium Falcon, making their way to Tatooine, ready to rescue Han from Jabba the Hutt. Canonically, we know the time between The Empire Strikes Back and Return of the Jedi is about a year and there’s nothing in this issue which really establishes what everyone has been up to. 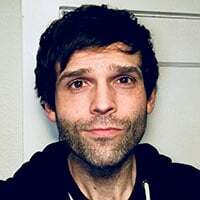 If you don’t mind jumping into this moment without too much context, other than what most of us would naturally assume, I think your mind will go right to nostalgia city. Mine sure did. 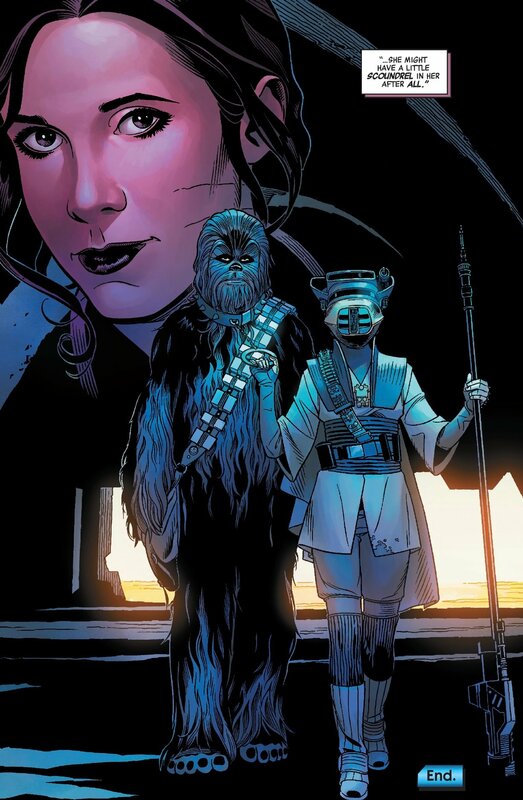 Leia is rummaging through Han and Chewie’s quarters and the melancholy is thick, though our general is not idly waiting for someone else to step up to rescue Han. She’s prepared to do it all herself, until the Rebel Alliance contacts the Falcon, requesting she and Chewie head to Arkanis. Lando’s in trouble. Bounty hunters are hot on Lando’s trail. I’m assuming the Empire was not terribly pleased with Lando’s withdrawal from their agreement, so whatever bounties Lando may have had on his head beforehand likely went through the roof. The Rebels report that Lando was shot down and in desperate need of help. Leia reaches him on his comm and directs him where to run. 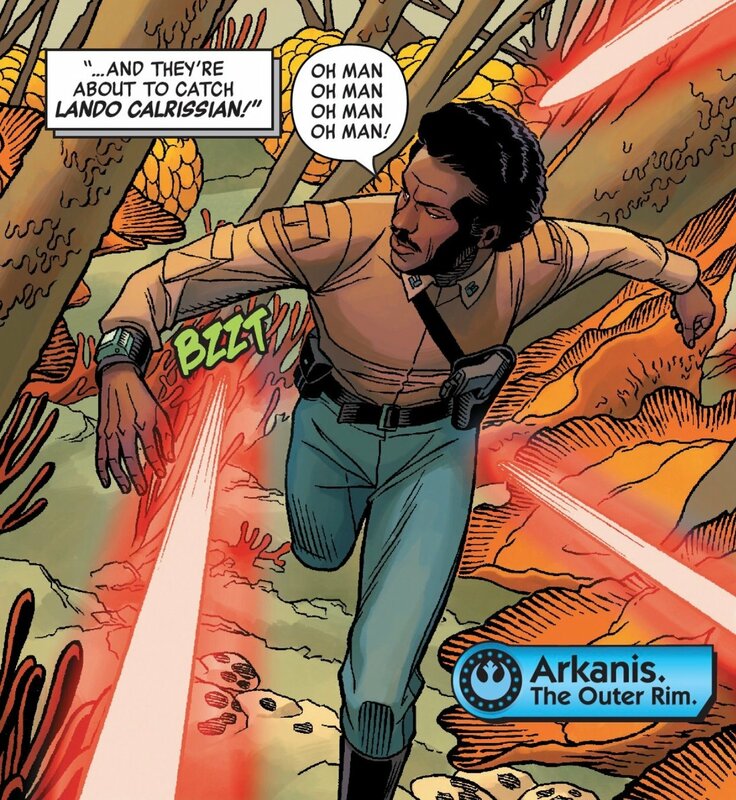 Lando reaches his destination, only to discover the likely culprit who’s planned his capture. 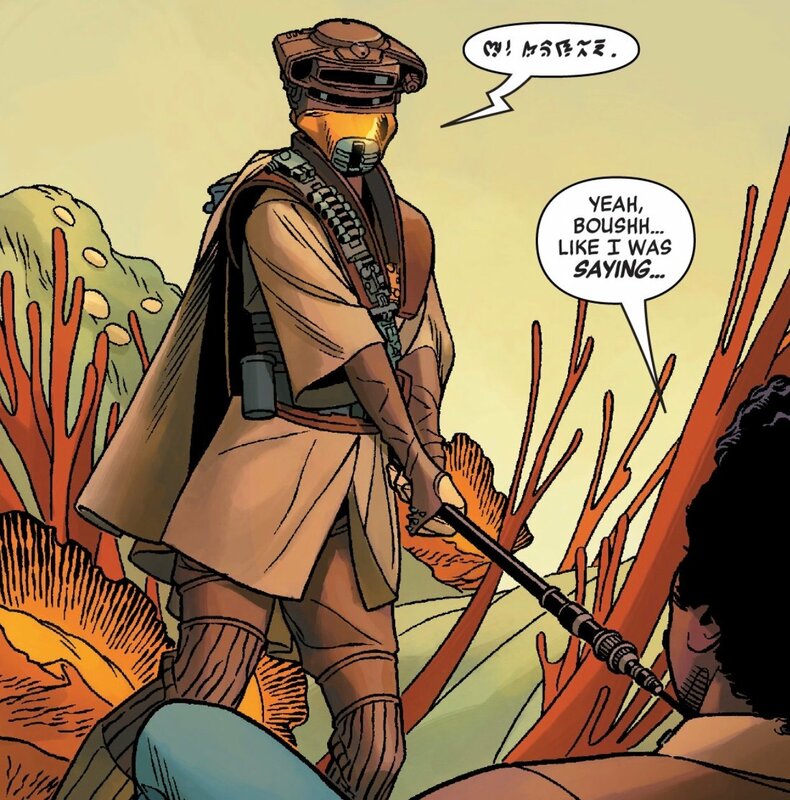 Lando seems to be familiar with Boushh. He’s immediately taken down, surprised as he remembers the bounty hunter not being as skillful in physical combat. Boushh has no problem containing Lando, who quickly tries to talk his way out of it, just like his friend Han. We get a familiar reveal Boushh is Leia when she removes the helmet and reminds Lando this isn’t the first time she’s had to fight. She’s not here to catch up, as Lando has so many questions, she’s more interested in getting back on her way to Tatooine. Leia explains she got the Boushh armor when the actual bounty hunter attacked her and Chewie on Ord Mantell. I couldn’t be sure if she was alluding to Han’s remark in The Empire Strikes Back, about that bounty hunter who scared him into leaving the Rebellion. I’d bet we get that story eventually in the titular series and Han’s involved somehow. Leia probably saved him, the more I think about it. This conversation here is something I never really considered. Leia and Chewie must have struggled to forgive Lando for his betrayal. I always understood the difficult position the Empire put Lando in and had sympathy for it, especially since he did the right thing in the end. I don’t know if I could say the same thing if it were done to someone I love, much like Leia and Chewie love Han. She still lays some blame on Lando, but he accepts that’s just the way it is, while still defending himself. He said he counted on Han escaping like he always does and didn’t know Vader planned on putting him into carbon freeze. It’s an interesting exchange. 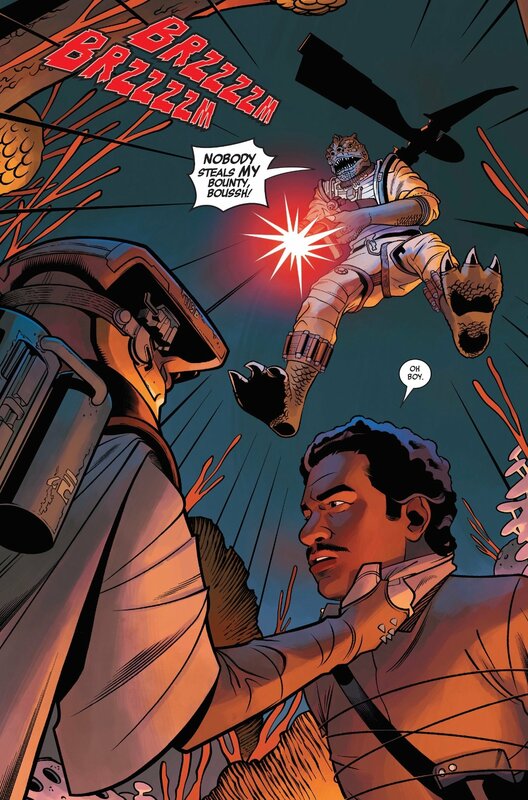 Suddenly, they hear shots fired and a Wookiee cry out in pain, as the other bounty hunters chasing Lando have decided to grab the bounty on Chewbacca instead. Bossk has picked up Chewbacca, while Lando and Leia track them, they are hesitant to attack, worried they’d alarm Jabba someone might be headed his way to rescue Han. Leia decides it’s better if she put the Boushh helmet back on and pose as the bounty hunter again. It also gives her a chance to practice her disguise as a warm-up act for the inevitable confrontation with Jabba. She approaches the bounty hunters inside of the local cantina and completely fools them. There are some great frames of Leia’s eyes, clearly uncertain if at any moment these scum could discover her true identity. Bossk is just such a villain. I’ve always been creeped out by him, since his first appearance next to Boba Fett and Darth Vader on a star destroyer. Here, he’s no less sinister and he’s referred to as the person who trained Boba Fett. Makes me wonder if Bossk himself has perpetuated that legend since that Clone Wars episode barely qualifies. No one likes to see Chewbacca in pain, so this just adds another layer of disdain. Leia convinces the bounty hunters she is Boushh and asks them why they want Chewie when they were hunting Lando. They figure they’ll get Lando eventually and they may as well collect the bounty on Chewie. It’s a soulless business, as we know, so the lives of these heroes are just currency for this scum. Leia leaves and they suspect their bounty hunter acquaintance may know where Lando is. 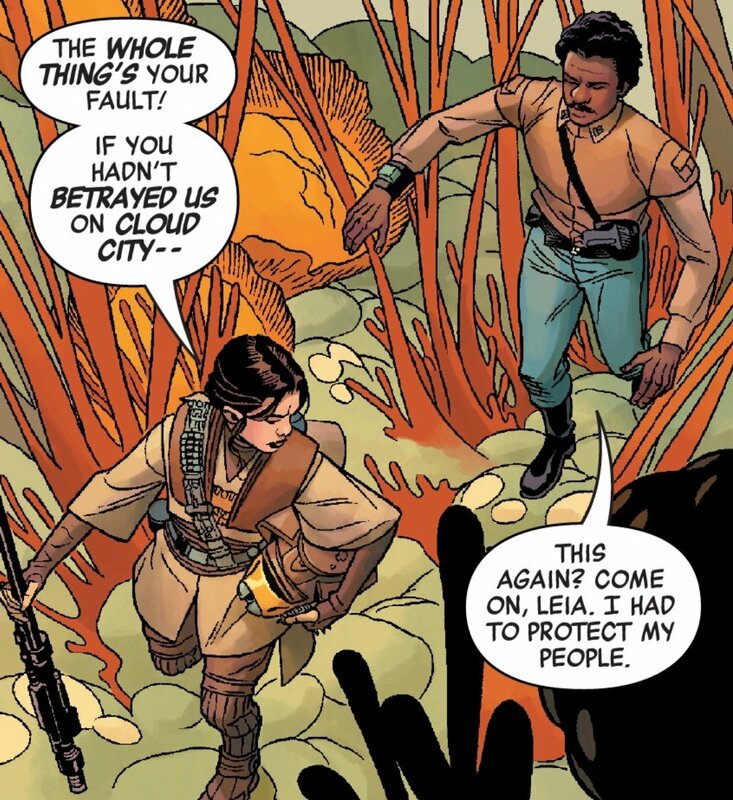 Leia uses Lando as bait. He pretends to be her prisoner as Bossk and his crew track them. I love this frame of Bossk dropping down on them. The art by Wil Sliney, Marc Deering, Karl Story, and colorist Tamra Bonvillain is perfect for this issue. The characters jumped right of the page for me and it felt like I was watching this scene come to life. 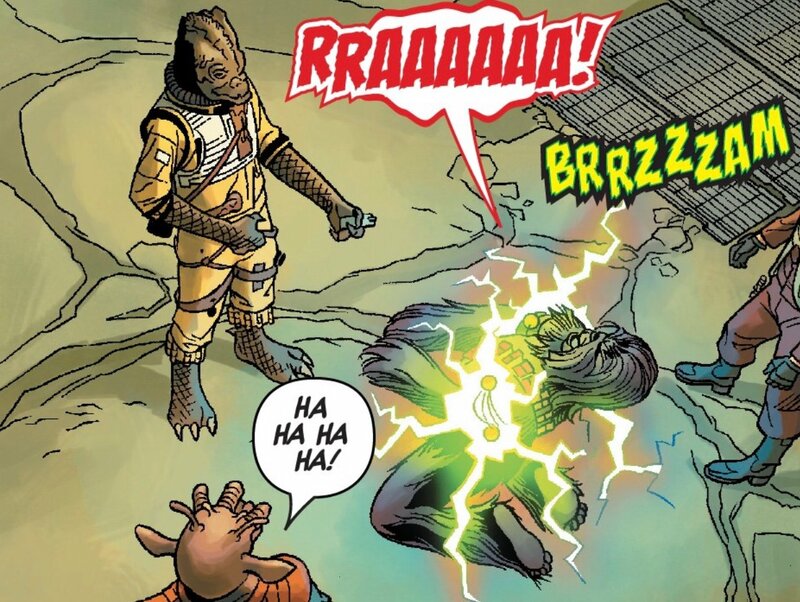 A pretty cool fight ensues, but Leia eventually disarms Bossk and gets him to return Chewbacca. She takes out the entire crew herself, leaving them alive but unarmed. Chewbacca is returned and the bounty hunters leave Arkanis empty-handed. The three of them catch their breath and Leia’s sure she has what it takes to pose as Boushh. They prepare for the big operation ahead. I loved this story. There’s also one of the best personal essays about what Leia means to the franchise by Bria LaVorgna I’ve read and it will warm your heart. I’d love it if she had an essay at the end of every one of these issues. It’s exactly what I hoped happened between The Empire Strikes Back and Return of the Jedi. Leia didn’t stop moving towards saving the one she loved. Her devotion also didn’t stop her from being a hero. Her strength always remained true and writer Greg Pak wrote her very well. 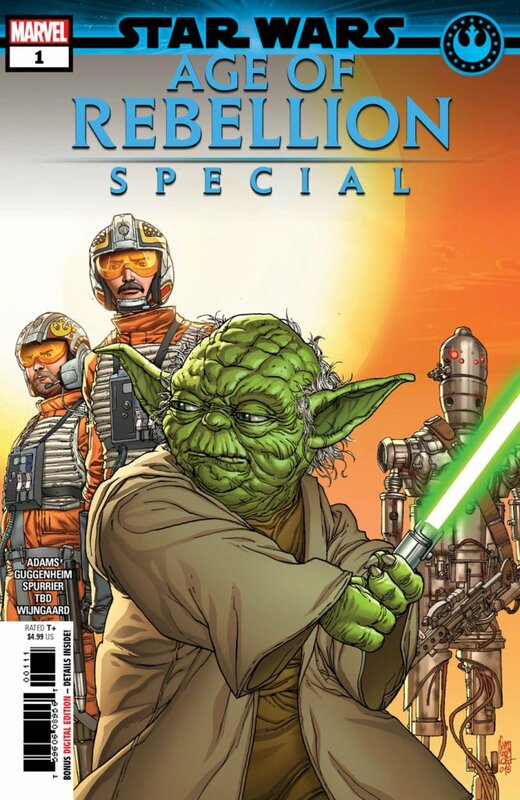 This issue gives me the feeling that every Age of Rebellion issue is going to be a must-own. We may be getting a lot of gaps filled in with this series – and there are two titles in the series they still haven’t announced! Make sure to check out Jelena’s review of Age of Rebellion: Tarkin. Get excited, Star Wars fans, there are so many great comics on the way!